Come along and help raise money and awareness of motor neurone disease. Have a family day out! or walk your dog! Enjoy the beautiful scenery on this delightful 6 mile walk (in total), from Tyneside Riverside Park, Newburn to Wylam (and back!). Issue 91 of the Newcastle MND Centre Newsletter is available for download (pdf). For the past 6 years at our Walk to D’feet one of our regular four-legged friends, ‘Kipper’, has been in attendance. The annual MND Walk to D’feet took place on Sunday 10th June 2018. It was a gloriously hot morning when we all met down at the Riverside Park at Newburn. UPDATE: The final total raised for this year’s walk is an £2626.75! Many congratulations and thanks to everyone involved! 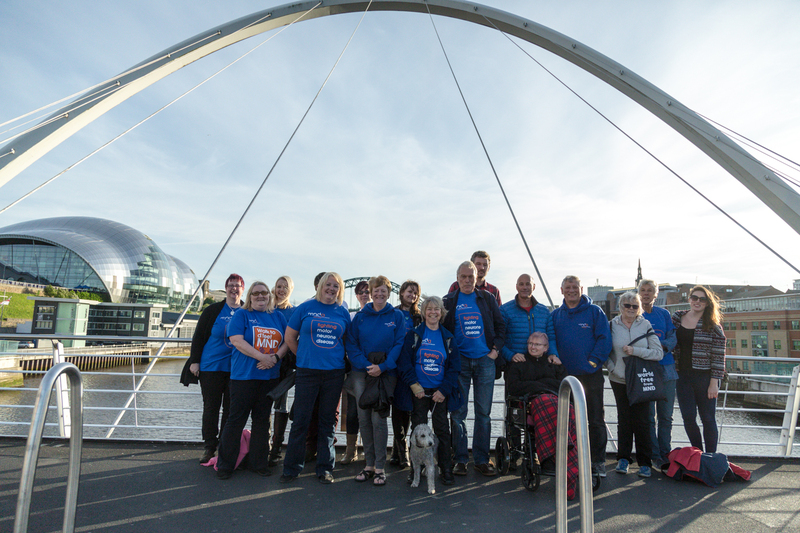 The Gateshead Millennium Bridge will be illuminated in the MND colours to raise awareness on MND Global Awareness Day 12th June 2017. The lights will be switched on at 8pm until 12midnight. There will be representatives there from 8pm come along and show your support. The All-Party Parliamentary Group (APPG) on MND is a cross-party group of MPs and Peers with an interest in MND. The MND Association provides the secretariat to the Group. Come along and help raise money and awareness of motor neurone disease. Have a family day out! or walk your dog! Enjoy the beautiful scenery on this delightful 6 mile walk (in total), from Tyneside Riverside Park, Newburn to Wylam (and back! ).